‘The blockchain — Not as secure as you think’ begins with an overview of blockchain technology, how it is used to enable the buying, selling and ownership of cryptocurrencies and its potential use cases beyond cryptocurrencies. It then explains the role of public and private keys, the issues surrounding the safe storage of private keys — and the reasons why cryptocurrency owners and custodians have been the victims of significant thefts of funds. The ebook then examines the roles of hot and cold wallets and of the multi-signature approach to security and explains how the tokenization of private keys holds the potential to promote consumer and institutional confidence in both blockchain applications as a whole and in cryptocurrencies in particular. 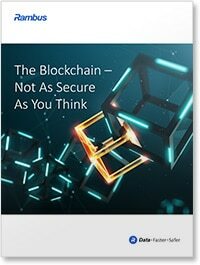 ‘The blockchain — Not as secure as you think’ has been produced and sponsored by Rambus and approved by the NFC World editorial team. This 13-page document is available free of charge to NFC World Knowledge Centre members (PDF format, 4.2MB).